The head-protection airbags work together with the side airbag system to give extra protection in a side impact. 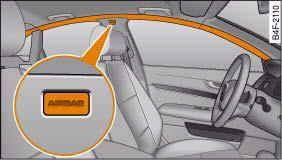 The head-protection airbags are located above the doors on the left and right sides of the vehicle, fig. 220. The locations of the airbags are marked with the word “AIRBAG”. In conjunction with the three-point seat belts and side airbags, the head-protection airbags give the occupants additional protection against head and neck injuries in a severe side collision ⇒ in “Important safety notes on the head-protection airbags” on page 208. Together with other design features (including cross-braces in the seats and the overall strength of the body structure), the sideguard system offers an effective further improvement to occupant protection in side impacts. When fully inflated, the airbags reduce the risk of head or chest injury in a side collision. In certain types of side collisions the head-protection airbag is triggered together with the side airbag on the impact side of the vehicle ⇒ fig. 221. When the system is triggered, the airbag fills with a propellant gas and covers the entire area in front of the side windows, including the door pillars. In this way the system is able to protect both the front and the rear occupants on the side of the vehicle where the impact occurs. The head-protection airbag inflates to soften the impact if an occupant strikes parts of the interior or objects outside the vehicle with their head. By reducing the head impact and restraining uncontrolled movement of the head, the airbag also reduces the forces acting on the neck. In addition, since it covers the front door pillar when fully inflated, the head-protection airbag also gives extra protection if the car should collide with an obstacle at an oblique angle. The front airbags, side airbags and head-protection airbags may be triggered together in certain types of accident. In order to provide the desired extra protection in an accident, the airbags have to inflate extremely rapidly (within fractions of a second). The airbag releases a fine dust when it inflates. This is quite normal and does not mean there is a fire in the vehicle. There are a number of safety points concerning the airbag system which you should remember. This will help to reduce the risk of injury in an accident. • It is important to ensure that the area around the openings for the head-protection airbags remains unobstructed at all times, so that the airbags can inflate properly if needed. • The built-in coat hooks should only be used for lightweight clothing. Do not leave any heavy or sharp-edged objects in the pockets. When using the coat hooks, do not hang the clothes on coat hangers. • The space between the passengers and the head-protection airbags must never be occupied by children, other passengers or pets. Passengers should never lean out or put a hand or arm out of the window while the vehicle is in motion. • Do not move the sun visors out to cover the side windows if there is anything attached to them (such as pens or a remote control for the garage door). These objects could cause injury if the head-protection airbag is triggered. • The sensors for the airbags are located in the front doors. You must therefore not make any modifications to the doors or door trim (e.g. retrofitting loudspeakers), as this could impair the function of the side airbags. Any damage to the front doors could lead to faults in the system. Repairs or any other work on the front doors must therefore always be carried out by a qualified workshop. 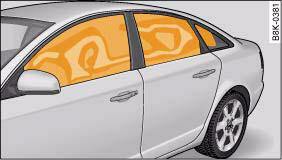 • Where sun blinds are fitted on the rear doors, these must not obstruct or impair the airbags in any way. • If unsuitable accessories are installed near the head-protection airbag, the protection afforded by the airbag can be seriously impaired if the system is triggered. When the head-protection airbag opens, parts of these accessories could be thrown into the vehicle and injure passengers. • Any work involving the head-protection airbags, or removal and installation of the airbag components for other repairs (such as repairs to the roof liner), must always be performed by a qualified workshop. Otherwise the airbag system may fail to work properly.